The second package of the Comprehensive Tax Reform Package is back in the spotlight after President Rodrigo Duterte urged its approval in his third State of the Nation Address. According to the President, Package 2 will benefit all businesses especially small and medium enterprises (SMEs). While it has recently found some support in the Senate, some senators have earlier expressed hesitations against the said tax reform package. Meanwhile, the House Committee on Ways and Means already filed a substitute bill named TRABAHO (Tax Reform for Attracting Better and High-Quality Opportunities), consolidating the many TRAIN 2 bills for review in the lower house. Among the many bills consolidated by the substitute bill are House Bill No. 7214 (Suansing and Suansing) and House Bill No. 7458 (Cua, Abu, and Gonzales)—two of the major TRAIN 2 bills. One of the main features of the upcoming tax reform package is the lowering of the corporate income tax (CIT). Despite other contentious portions of Package 2, it is generally seen as a welcome development. In Southeast Asia, the Philippines currently has the highest CIT rate at 30 percent. TRAIN 2 seeks to lower that, with the two main bills (HB 7214 and HB 7458) proposing different ways to lower the tax rate. In House Bill No. 7214, the CIT will be lowered by one percentage point for every reduction in incentive expenses amounting to 0.15 percentage point of the GDP two years prior to the passage of the bill. Simply put, if the bill were to be passed in 2018, for every reduction in incentive expenses equivalent to 0.15 percentage point of the 2016 GDP, there shall be a one percentage point deduction to the CIT. Under this bill, the CIT can only go as low as 25 percent. Under House Bill No. 7458, the CIT will be unconditionally reduced by one percentage point yearly. Under this bill, the CIT can go as low as 20 percent. 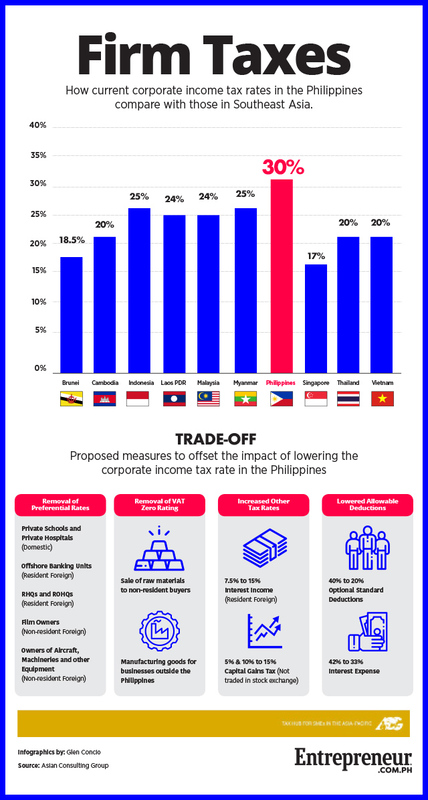 As a revenue-neutral proposal, this lowering of income tax will be offset by modifications of other revenue sources, such as the removal of certain fiscal incentives of several industries. Several tax rates will also be increased such as the interest income of resident foreign corporations, capital gains tax and tax on intercorporate dividends of nonresident foreign corporations. Optional standard deductions have been lowered from 40 percent of gross income to 20 percent. The allowable deductions for interest expense will also be lowered proportionally to the lowering of CIT. However, all these offsetting measures are minor ones. The main offsetting measure, which has been heavily criticized by the Philippine Economic Zone Authority (PEZA) and recently by the Board of Investments (BOI), is the incentive reform. In fact, HB 7214 already directly proposes that in order to lower the CIT, there must be a certain percentage reduction in incentive expenses. According to a statement by the Department of Finance, almost 90,000 small and medium enterprises (SMEs) still pay the regular income tax while there are as many as 645 firms that continue to receive tax incentives for at least 15 years. These small and medium enterprises that do not benefit from incentives in the first place stand to gain the most. Based on the latest data from the Philippine Statistics Authority (PSA), in 2016, micro, small and medium enterprises (MSMEs) comprise 99.57 percent of all businesses in the country. Of this percentage, 9.5 percent are small enterprises and 0.44 percent are medium enterprises. These two sectors stand to gain the most from the bill. Small and medium enterprises contributed 25.70 percent and 7.16 percent respectively to total employment in the country. Combined, SMEs contribute 32.86 percent to national employment, just behind the 36.72 percent contribution of large businesses. Notably unaffected are the micro enterprises which comprise the 89.64 percent of all businesses in the country. Under the Magna Carta of MSMEs (RA 9501), micro enterprises are defined as having assets amounting to Php3 million or less. This is also the threshold for the Barangay Micro Business Enterprise (BMBE) classification, which already receive income tax exemption under the BMBE Act of 2002. Still, there will be plenty of businesses that would benefit from the lowered CIT. The entire Comprehensive Tax Reform Program appears to be encouraging investments from within the country by empowering SMEs. The TRAIN Law started the trend by providing better tax rates for Self-Employed and Professionals and increasing the VAT threshold, while TRAIN Package 2, or TRABAHO as it is now called, follows suit by providing those small businesses registered as corporations to avail of lower tax rates. These changes present opportunities for executives to take advantage of. Businesses need to reassess their current tax plan and see if it still remains the most optimal path to pursue. Just as there are many pitfalls to the tax reform package, there could be many opportunities that business owners might miss if they do not have proper guidance. To learn more about how to take advantage of the tax reform, email consult@acg.ph for an Executive Tax Briefing. With the right tax plan, businesses can earn more efficiently.